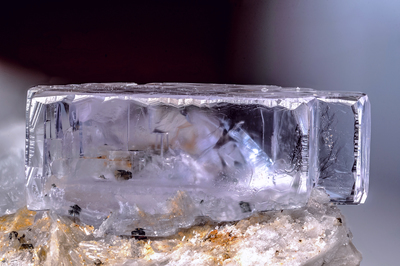 Parallel association of fluorite crystals of light purple color, predominantly cubic but with abnormal development of one side, so as to seem a parallelepiped. The child photo shows better how the edges present hex'hoctahedron faces, similar to ivy leaves. Collection and photo of Gianfranco Ciccolini. Nikon D750, bellows, Scheider Kreuznach Componon 80 mm; f: 5.6. Focal using 7.